This is a second post on using OpenCL on the Chromebook ARM. The previous one gives instructions to install OpenCL drivers and SDK on the Samsung Chromebook ARM, without requiring to boot a separate Ubuntu, by using crouton. 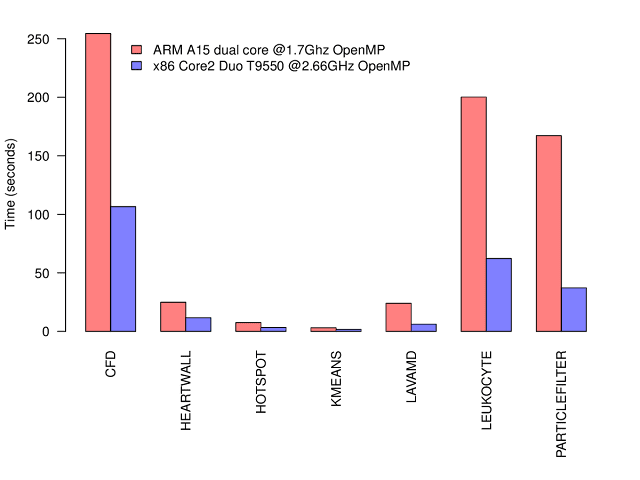 This post compares OpenMP and OpenCL performance of the Chromebook ARM with a 4-year old laptop. In these tests, I compare my 4-year old Dell laptop with the Samsung ARM Chromebook. It's obviously not a very fair comparison: The laptop is quite obsolete now (and will actually be replaced soon). On the other hand, the Samsung ARM is a budget device, with a ridiculously low power consumption. 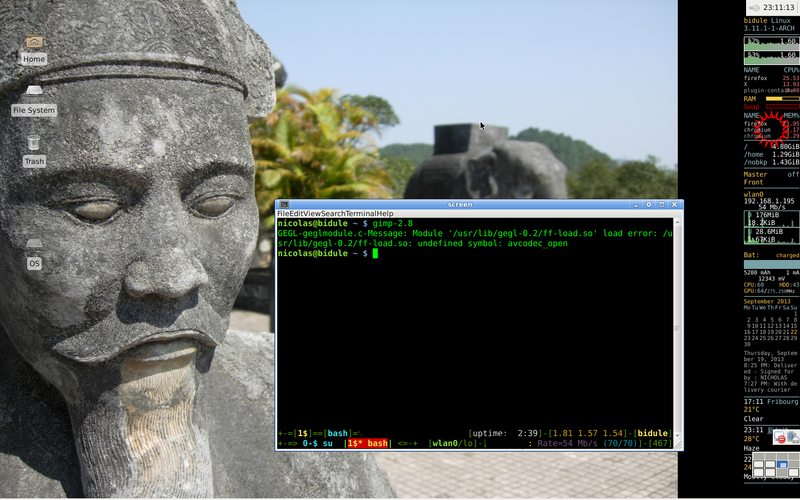 As a benchmark test suite, we use Rodinia, a CUDA/OpenMP/OpenCL test suite from the University of Virginia. 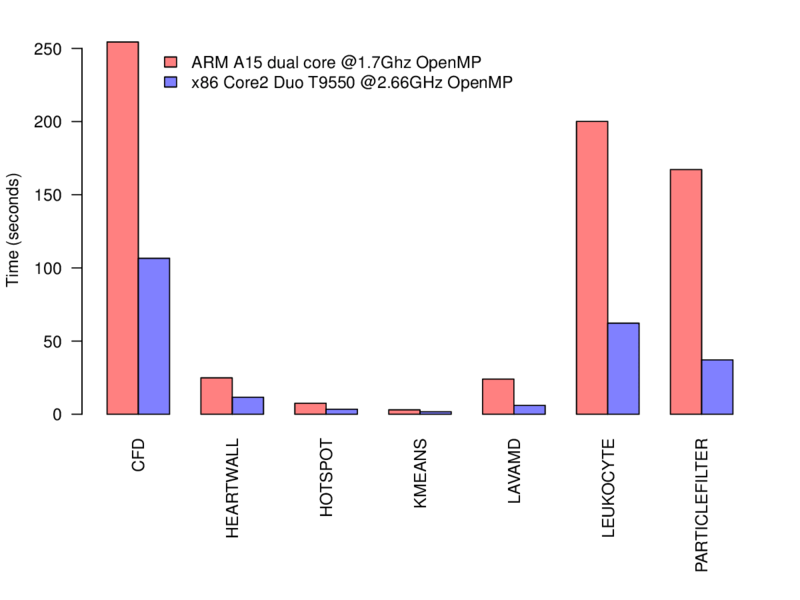 The test suite does not compile unmodified, and for some OpenCL tests, the number of threads need to be reduced to fit in the limited memory of both computers. Complete instructions and patches can be found in my github repository. The ARM CPU alone is between 1.75 and 4.5 times slower (average: 2.87 times slower). Not a big surprise considered the lower frequency and simpler architecture. On the other hand, the Chromebook stays cool (no fan! ), while the Dell laptop blows out hot air on the side. And this is where we get a nice surprise: the ARM GPU is very close in performance in most tests. Excluding ParticleFilter, which is 8 times slower, the GPU is, in the worst case, 1.94 times slower, and it is even 1.8 times faster in the Kmeans test (average: 1.25 times slower). For some reason, I could not get the OpenCL code to compile on the Samsung ARM for LavaMD (it fails with CL_INVALID_KERNEL_ARGS), but I didn't try very hard. Let me know if you find a way! It would also be interesting to figure out why ParticleFilter is so slow. As you can see, the results look identical in all cases. As you can see, running the OpenMP code on ARM and x86 gives identical results. 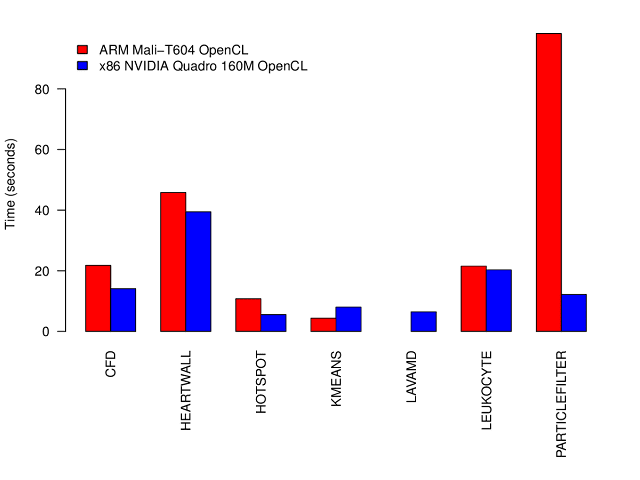 The OpenCL results are also very close. That basically means the comparisons above between the 2 laptops is fair. 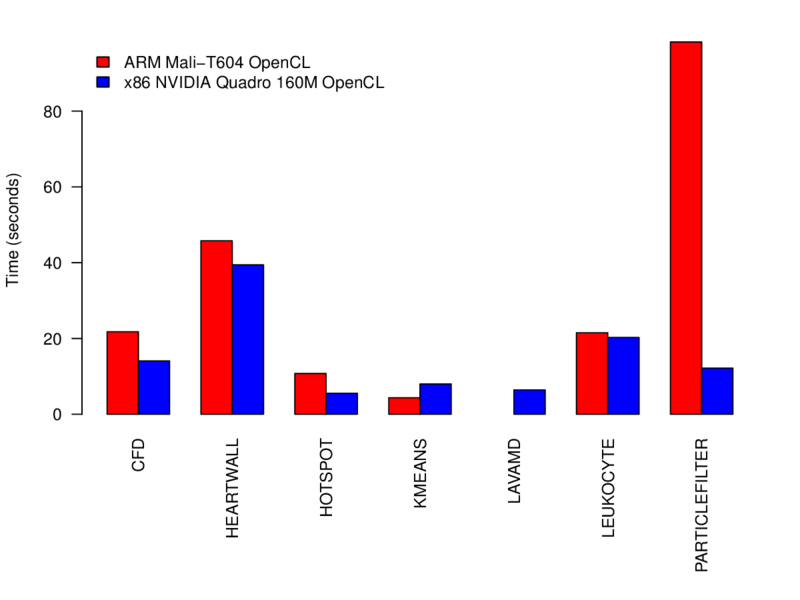 The next graph shows all the results aggregated. 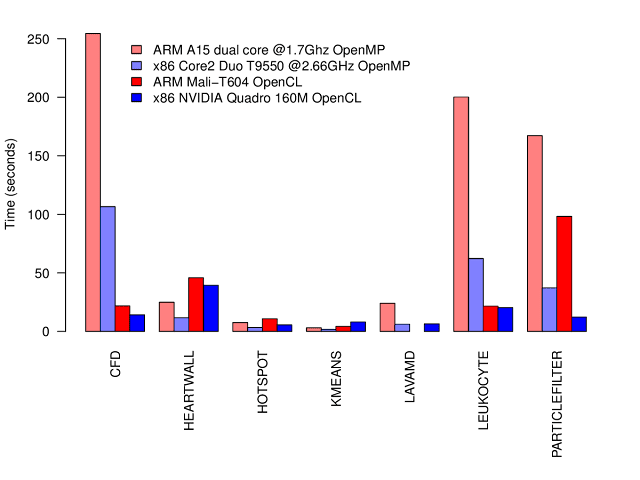 Assuming OpenCL and OpenMP implementations give similar results (which is actually doubtful in some cases, see the previous section), running OpenCL code on the Samsung Chromebook ARM can help a lot in terms of performance: On the Dell laptop, using OpenCL improves performance by a factor 2.25 on average. On the Chromebook ARM, the ratio is 4.1! And this is without any attempt at optimizing the code for the Mali architecture, which is quite different from a normal GPU (in particular, it has no local memory, so data does not need to be copied back and forth). 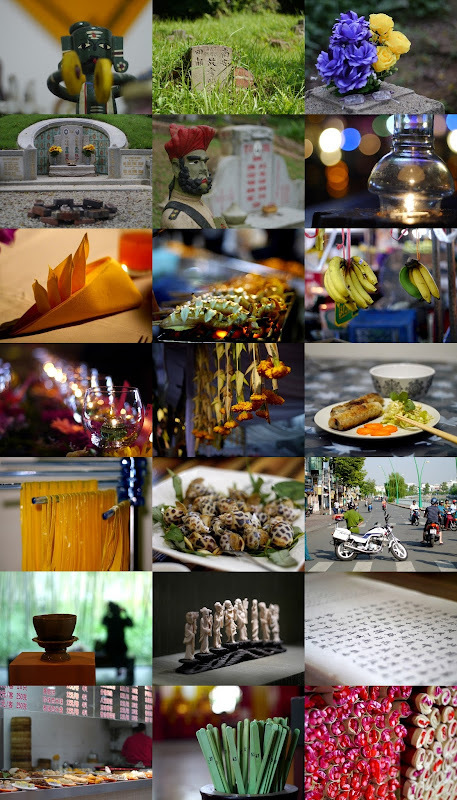 I'd also like to try some real applications, my next project is to get darktable running (a RAW photo developer). Do let me know if you have some real applications using OpenCL! I'll follow up with another post if I get them to work. In this post we’re going to look into OpenCL development on the Samsung Chromebook ARM, using crouton, and turn your Chromebook into a tiny supercomputer for CFD or bioinformatics. ARM recently posted some instructions about OpenCL development on the Chromebook ARM, but these require creating a separate Ubuntu installation that you boot off a USB drive, and are quite lenghty. The instructions I provide here are very simple: They make use of crouton, that allows you to run Chrome OS and Ubuntu in parallel, so that you can develop OpenCL applications without rebooting. crouton: Read the information there if you do not know (yet) what crouton is all about. One important note, crouton requires that you switch your Chromebook to developer mode, which wipes all the data on the Chromebook (but that's required by the ARM approach as well). Chrome OS does not provide an OpenCL driver, but you can get it from this page: Mali Binary User Space Driver, Linux r3p0-02rel0 (22nd October 2013), X11 version. You can use this direct link to get the tarball. Luckily, the newer userspace drivers work with the current kernel drivers in Chrome OS. ARM Mali OpenCL SDK, so you can test some pretty examples. We are going to create a precise chroot (Ubuntu 12.04, but other releases should also work). You need at least the x11 target to be installed, as Mali libraries depend on X11 libraries. 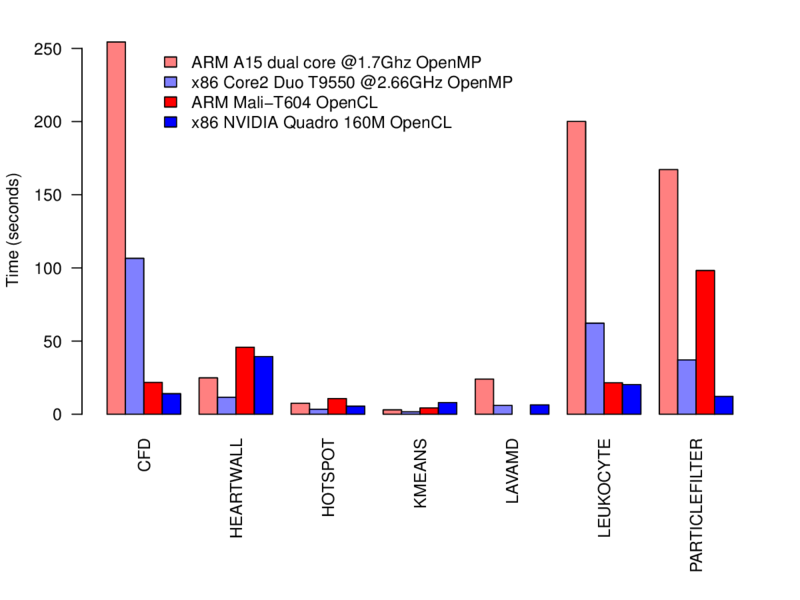 This is actually an artificial dependency: OpenCL itself does not require X11, but the ARM Mali library is a single blob that provides OpenCL and OpenGL ES, and the latter depends on X11 libraries. We’re going to install xfce, as it pulls in the x11 target, and gives you a nice and light desktop environment. This will take a while, depending on your Internet connection speed. [PLUGIN ERROR] Couldn't open default config file './default.instr_config'. [PLUGIN INFO] CINSTR GENERAL: Output directory set to: . [PLUGIN INFO] No instrumentation features requested. 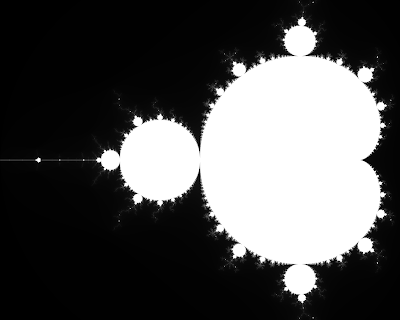 In exchange for 2 seconds of GPU time, you get a nice Mandelbrot fractal in output.bmp. That’s it! The next post will focus on some benchmarks, and comparison with a x86 laptop GPU and OpenMP implementations. One of the strong points of the Micro Four Thirds (MFT) system is that, thanks to its short flange focal distance, you can mount lenses designed for almost any other camera system. I believe you can get the best deals by buying Olympus OM lenses: There is no current camera supporting those lenses anymore, but they were produced in mass in the 80's and 90's. These are ingredients for a high supply, low demand, therefore low prices on auction websites. This is especially true of the Olympus OM 50mm, f/1.8, that used to be a kit lens with many film Olympus cameras. Almost a year ago, I bought one on eBay, for 13.50 USD (+ 11 USD shipping). I mounted it on my Panasonic DMC-GX1, using a OM to MFT adapter (less than 10 USD). I originally bought this lens to use it as part of a custom tilt-shift adapter, but realised that the 50mm focal length is usually too narrow, and purchased a Promaster 28mm f/2.8 for that purpose (OM mount as well). This lens is really amazing (especially considered its price): It becomes a short telephoto lens on the MFT system (100mm full-frame equivalent), which gives you interesting constraints: you have to focus on details, or put some distance between you and your subject. The large aperture makes it particularly interesting in low-light conditions (museums, night markets, etc.). On the other hand, it does require ND filters in bright daylight, as you are hitting the maximum shutter speed of the camera (1/4000s for the GX1): a 3-stop ND filter, that is ND8 or 0.9 optical density, works perfectly for these situations. I actually never stop the aperture down: I would rather switch to another lens if I want more depth of field. Focusing is not easy, especially without a viewfinder. MFT cameras provide a magnified view to help you focus, but, with a bit of practice, I'm able to get a reasonably good focus without using that mode, by moving the ring back and forth until I have a good idea of the best position. The lens I got was in good condition, except for the aperture, that is a bit sluggish: you need to jiggle the aperture ring to get it back to f/1.8 if you stop it down. I could also see some oil on the aperture blades: probably the reason why the mechanism is not working as well as expected. 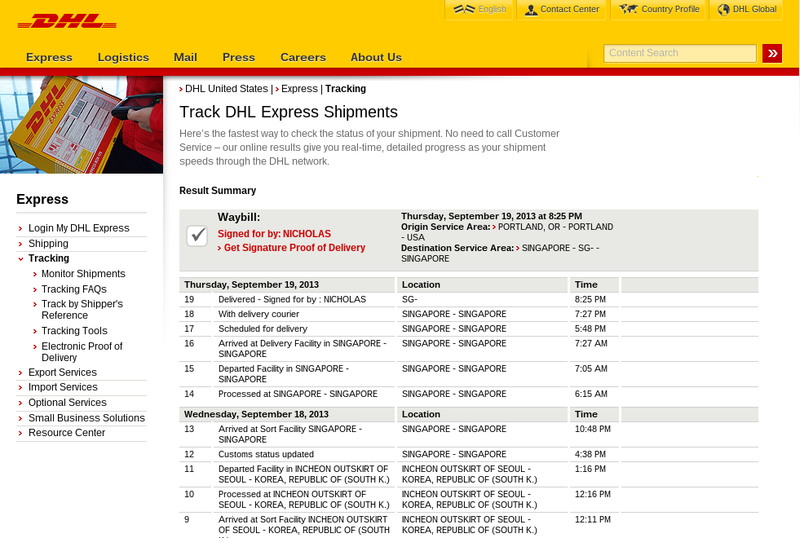 But again, since I only use it at maximum aperture, this is not really a concern for me. Each of the bokeh rings shows some black spots at the bottom: looking through the lens, I can see some oil marks. 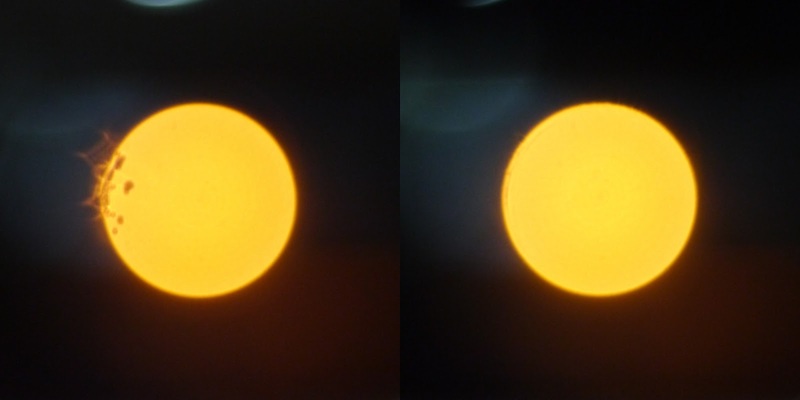 The next post will show you how I managed to fix the problem, by opening up the lens.